It is no secret that I despise the modern school system. I believe it kills creativity and self-confidence, makes children hate learning, and creates an unnatural unhealthy social atmosphere, among other problems. This is why I am a huge fan of alternative methods of education. You see…it turns out that humans don’t really need school. Many people across the globe educate themselves daily without the need for grades, subjects, and exams. They are self-motivated and driven, and often use one or more of the following alternative methods of education. So here are 10 alternative methods of education that you can apply to yourself or your children. I believe all 10 of these methods are more effective than traditional school teaching. NOTE: Even if your children go to school, you can still utilize these methods after school hours, during holidays and on weekends. Just hang out with your children and discuss topics that they are interested in. Children learn far more in an hour of healthy respectful discussion than in an entire day of forced schooling. When making time for your children, make sure in include time to discuss the topics that really matter to them. The world isn’t divided into subjects like science, maths, geography and history. It is all interlinked. So why not utilize a similar method to teach your children. Focus on themes and topics, and explore everything related to the topic. For example, the biography of Al-Khawarizmi can be a theme. From this theme, they can learn Islamic History, Maths, Science, History of Maths and Science, and Life Lessons, without using any of these terms. An integrated approach is more natural and holistic. Unschooling is the philosophy that humans learn best when they are self-motivated and left to explore their personal interests. It is the belief that if children are left on their own, they will learn whatever they need to excel in life without being forced to learn specific subjects. I was skeptical of this philosophy at first, but after experimenting with it for a few years, I have found it to be very effective. Learn more about my homeschooling experiments here. This is the oldest education method I know of. It existed long before the modern school system, and is very effective. For some reason, humans have moved away from it despite its effectiveness. This is a very simple method: If your child is interested in a career in a specific field, let him serve as an apprentice to an expert in that field from a young age, and he will grow into it. Simply put: if your child admires an adult member of your community for their piety, good manners, or other great qualities. Then ask that community member to mentor your child. He/she can become a positive role model and influence on the child, and the child will learn much more from conversations with a mentor than from the school system. Good old school reading. Nurture the love of reading in your children. Develop in them a love for non-fiction especially. If you can nurture in them the love of reading non-fiction, then they will continue reading for life. And will continue learning for life. This is one of the most important habits you can nurture in your child. Why limit education to the subjects that schools teach? If your child takes an interest in a subject not taught in school, sign them up for an online course in that subject instead. They will learn very quickly with online courses. 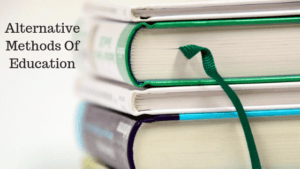 We, at Islamic Self Help, firmly believe that online courses and reading books are two of the most effective ways to learn any topic, this is why we publish many online courses and eBooks. Not all alternative methods of education are home-based. People learn a lot from travelling. We learn about the natural world, different cultures, different religions, and crucial life skills from travel. Children benefit greatly from such experiences too. If you can afford it, travel with your children. Worldschooling is an amazing educational experience for any child who is lucky to experience it. The art of writing is not just a hobby or a means of doing work. Writing in private, for example, in a diary, allows a person to look at their thoughts, reflect on them and engage with them. This is a very important learning experience for anybody. Teach your child this method of self-reflection, then give them the privacy to explore their thoughts in writing. They will learn so much from just writing to themselves and reflecting on it. Children learn through play. In fact, so do adults. The easiest way to learn any skill is to make it fun. For some reason, people have forgotten this and even Kindergarten isn’t fun anymore. This is why I love the Montessori education method. It recognizes the importance of fun in learning. Turn your home into a fun environment full of edutaining activities and games. Let the children explore, have fun and enjoy these activities and games. They will learn fast and naturally without any adult enforcement. Learning through fun is so effective that some children teach themselves how to read and do maths just by playing fun games on their own. So there you have it, 10 alternative methods of education. Pick one and try it out. You won’t regret taking the time to help your child rediscover their love of learning. 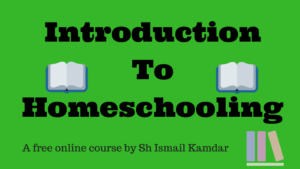 To learn more about homeschooling, sign up for our free online course here.